Chicken tikka is a favorite with the folks at home. The kind you get in the restaurant is often too red with the food colouring, very oily and way too spicy. Not that we don’t like that, but it is nice making it at home as well. Of course, you do not get the smoky flavor of the tandoor, but it still turns out pretty tasty and wholesome. I make it in my Airfryer and it gets a lovely caramelized look and is tender and juicy to eat. This is a robust and tasty chicken tikka recipe. Chicken breast is marinated in Indian spices and then grilled for a delectable treat. 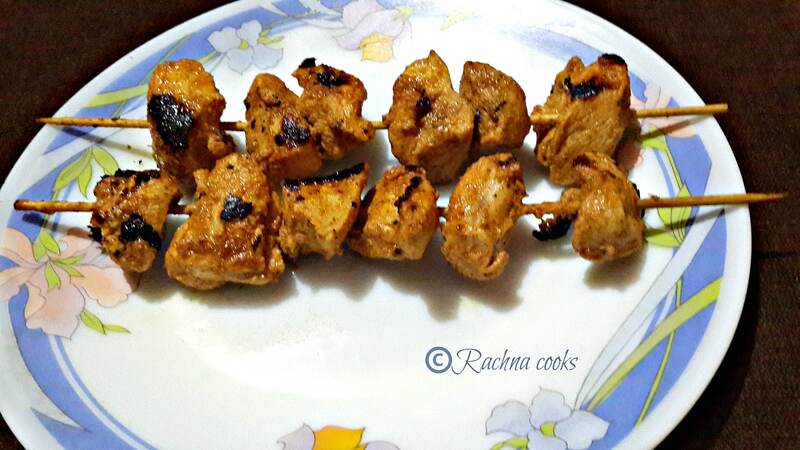 The key in making good chicken tikka is in its marination. Take all the ingredients of the marinade and mix to form a thick paste. Evenly coat chicken pieces with this marinade and keep for 4-8 hours or even better overnight for the flavours to get absorbed. Now pre heat your airfryer at 160 deg for 6 minutes. Take skewers and put the chicken tikka pieces in. Baste with some butter/oil and grill in airfryer at 160 degrees for about 8 minutes. Next raise the temperature to 200 degrees and grill for about 6 minutes till it gets a lovely smoky look. You can do the same in a conventional grill or oven. Check the times depending on the type of your oven. We cook first at low heat to cook the chicken from inside and yet keep it moist. The high heat cooking is to give it a nice charcoal grill look. When using airfryer, turn the skewers halfway through the cook so that both sides get cooked evenly. Don't overcook or the chicken will become stringy and chewy. You could also do this on stove top by cooking on a hot tava/skillet. Heat a skillet. Pour some oil and put the tikkas. Cover with a lid and cook on medium heat till both sides are done. Enjoy your hot and tasty chicken tikka and wow your family and friends. Do share with me if you like the recipe. very nice and interesting recipe. 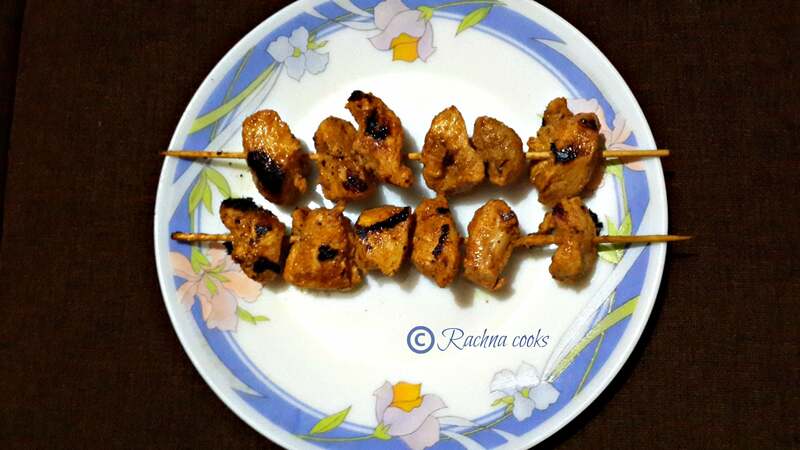 I am very fond of chicken but fail to make a chicken tikka…I have noted down the entire recipe along with the process and will surely try it out this weekend and will get back to you with the feedback…keep posting with lots more…. Thank you, Shreya. I look forward to your feedback. It looked delicious.I wish I could have one stick from here. It’s same as Tandoori Chicken Tikka, right? There’s a Masala exclusively available for that. Thanks, Sapana! Who doesn’t indeed!